There are some noteworthy advantages to skiing at a world class ski resort. One of those is not having to worry about avalanches when you’re standing right next to the lodge. But when you are visiting a ski resort in Turkey, those luxuries just don’t always apply. 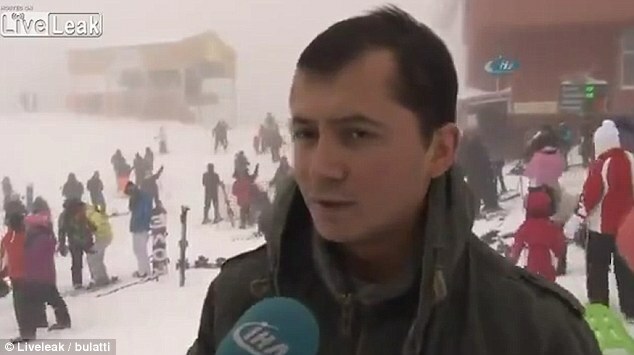 Take the resort of Kartepe in Turkey where a manager was giving an interview on live television while an avalanche swept down the mountain overrunning a group of skiers behind him. Although mayhem is ensuing behind the scenes, the interviewee seems to keep his calm. While the incident reportedly took place several years ago, it has been making the rounds across the internet lately. And it is ski season. A translation by the Daily Mail reported what the manager is saying. “The heavy snow had much effect. Those who like snow, skiing are coming here,” he said, while the avalanche barrels into the group behind him. A capture of the scene afterward shows people frantically digging people out of a pile of snow. Fortunately everyone made it out unharmed, we’re told.